WE ARE CO-SPONSORING LAGQ IN CARMEL THIS COMING SATURDAY, OCTOBER 27. CALL FOR INFO, GET TICKETS AND COME TO THE CONCERT. LOS ANGELES GUITAR QUARTET in Carmel, CA. Monte Verde St. & 8th Ave. Cost $35 at the door, $30 if ordered in advance, $20 students. 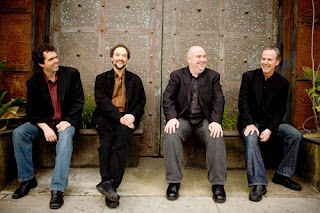 Recognized as one of America's premier instrumental ensembles, the Los Angeles Guitar Quartet is one of the most charismatic groups performing today. Popularly known as the LAGQ, these four virtuosi bring a new energy to the concert stage with their eclectic programs and dynamic musical interplay. Their critically acclaimed transcriptions of concert masterworks provide a fresh look at the music of the past, while their interpretations of works from the contemporary and world-music realms continually break new ground. The LAGQ has set new standards for the classical guitar quartet medium. Order tickets through the Carmel Classic Guitar Society. Directions to the theatre here. Tuning the the guitar is perhaps the most important thing you can do when you sit down to play. The greatest music played by the greatest virtuoso is upsetting when the guitar is out of tune, yet if the guitar is really in tune, even just playing the open strings on a guitar has a wonderful aeolian, flirty effect on a room. Many performers-even some very famous ones-get disoriented in their tuning process. It's maddening to be sitting in the audience waiting for a performance to start while the player aimlessly twists tuning knobs without getting any closer. You want to run up and grab the guitar and tune it for him. First, you have to be able to hear relative pitch, that is, which note is higher and which is lower. To some people it's obvious, to some it's not. When working with beginners this can be one of the hardest barriers to overcome, and for me it is one of the hardest things to teach. The second problem is strategy. You need to establish one good pitch and tune the other strings to it in an orderly system, without introducing errors that get carried forward. Third is compromise. The tough thing to accept is that the guitar will never really be in tune. The piano is an "equal tempered" instrument. The guitar is only "sort-of equal tempered". Equal temperament was developed in the 18th century as a way to allow the keyboard to play equally well in all of the twelve key signatures. This is a strategy of intonation that sacrifices perfect "beatless"intervals by distributing slight inequities throughout the 12 half-steps in an octave. This way the octaves are the only intervals that are truly in tune, with all of the other being a little bit sharp or flat. Even in equal temperament some intervals are marginally more in tune than others. To someone who has been raised on the fixed intervals of a keyboard or fretboard these "off tune" intervals sound normal, but to a singer or string or wind player who has complete microtonal control over pitch, it can sound-and be-out of tune. There are cultural assumptions as well. Listen to the music of many other parts of the world and you will hear beautiful effects from scales and intervals that have nothing to do with our idea of "in tune". But with the guitar temperament issues are even more confounding than the keyboard, because each fret must cover six notes, each string covers many notes, and each string has a different stretch response from fretting. Any given note can be well off center of equal temperament in the keyboard sense. Add to this the fact that the response and quality of guitar strings varies widely from brand to brand, and even from package to package, and you have a serious need for skill, strategy and compromise to tune a guitar. I present here a modest proposal for a simple but effective tuning system. I must presume that the guitarist can perceive the difference between higher and lower, between sharp and flat. The strategy is simple-establish one correct reference note, then tune the remaining notes to that reference note. This is the strategy of the orchestra, where the oboe sounds the tuning note and everyone else tunes to that. In our case we will tune the sixth string, and tune the remaining five strings to it. 1) Tune the 6th string. 2) Play the 6th string 5th fret harmonic. 3) Play the 5th string 7th fret harmonic, and adjust the pitch. 4) Again play the 6th string 5th fret harmonic. 6) Again play the 6th string 5th fret harmonic. 7) Play 3rd string 9th fret, fretted. Adjust pitch. 8) Play the 6th string 7th fret harmonic. 9) Play the 2nd string open and adjust pitch. 10) Again play the 6th string 7th fret harmonic. 11) Play 4th string 9th fret fretted. Adjust pitch. That should be it. As you see we have tuned all of the strings to either the E or B harmonics found on the low E string. This is by definition a "perfect fifth" which in this context actually introduces it's own modifiers, but by maintaining the same -string reference point and mixing harmonics, open strings and fretted notes, this system creates it's own guitar temperament, adding a further layer of compromise that helps blend the guitar's special intonation needs. Learn this tuning sequence as a little ten note melody that you can play easily, without thinking, and it will help you get in tune quickly and with poise, even under difficult circumstances. In guitar concerts I prefer quiet, discreet and mercifully short tuning breaks, so the player and the audience can get on with the business at hand. The dimensions of the 3rd string make it stretch differently. It is plump and rebellious, and in any tuning issues it's the first suspect. Also it will naturally raise in pitch dramatically with temperature, be it from stage lights, warm bodies or just your hands on the neck. When you're playing, just plan on it going sharp, and expect that string will need to be tuned down. There will always be exceptions and the need for micro adjustments. Some pieces may have exposed passages in a remote key that still show up out of tune, and may require tweeking a particular string before you start playing. Little compromises can be made without ruining the intonation of the rest of the piece. This is just part of the planning for performance, and these pre-adjustments should be memorized right along with the music. Also a dropped D or dropped F# tuning will require a little adjustment from normal guitar tuning to take advantage of these tunings' pastoral harmonies. It's helpful to be sure that all of the strings are well tuned before modifying the tuning. And of course you have to expect a lowered string to raise in pitch over the next couple of minutes, and plan for adjustment. Get in tune before you start to play. Make it easy on yourself and on your audience. This will make the world a better place. *This article will be archived on the website for further reference in the ARTICLES section under NEWS.